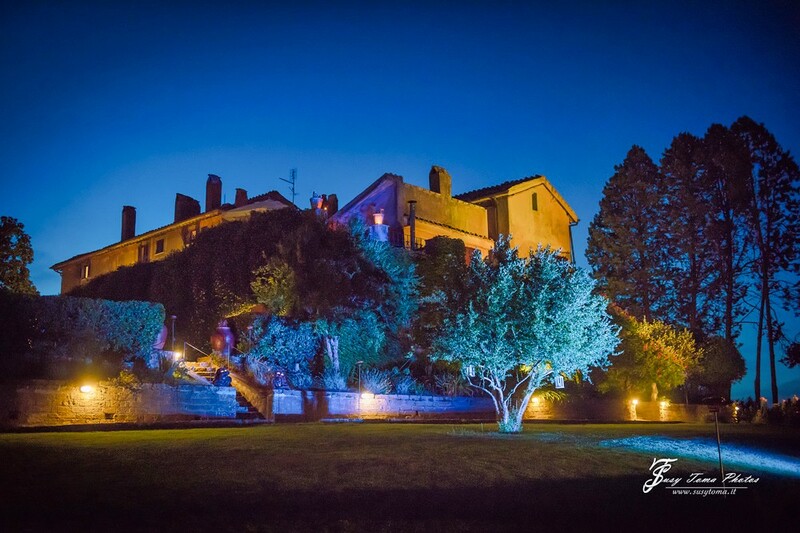 Castellina de Miremont is one of the most exclusive residences in Lazio, just 25 km north of Rome (20 min by car). Built in the early '400 as a hunting lodge, became later one of the favourite country manors of Pope Alexander VI. The sweetness of the panorama with green hills, olive trees and pastures, dominated by the imposing shape of mount Soratte, the attractive charm of the castle,its wrapping architectural design, slightly sinuous and irregular, the elegant tree-lined entrance, give the guest the immediate sense of entering in a different, serene environment. The Castellina is surrounded by a park of secular trees, swimming pool, a rose garden with white roses embracing a beautiful cottapaved square for entertainmaint and dancing. An orchard and an olive grove enrich the 7 acres estate surrounding the manor. The original Tiber cobblestones courtyard with well and woodoven,the romantic columned loggia overlooking the courtyard, leads to a large terrace with a breathtaking view. Around the villa there are many romantic spots where you can enjoy the particular charm of the place, ideal for photographic services. The interior is tastefully furnished with antiques, old and modern paintings matching with elegance style and ambience.The various rooms on two floors , adorned with epoch fireplaces and a spiral staircase of great artistic interest, allows you to savor the aristocratic charm of the property. Outdoor receptions can accommodate up to 300 people. The nearby Church of the Saints Vincent and Anastasius, dating from 1200 recently restored, is among the most beautiful in the surrounding area As a deputed seat of the Town Hall, the Castellina grants the right to celebrating in its rooms and gardens the authentic nuptial civil rite. Castellina de Miremont has successfully passed the 100 Quality Controls established by the "Certification Protocol of Historic Houses of Excellence" and is properly certified by the ITALIAN REGISTRY OF THE HISTORIC HOUSES OF EXCELLENCE. The phone number of Castellina de Miremont is +39 0761597002 or 3404085792.